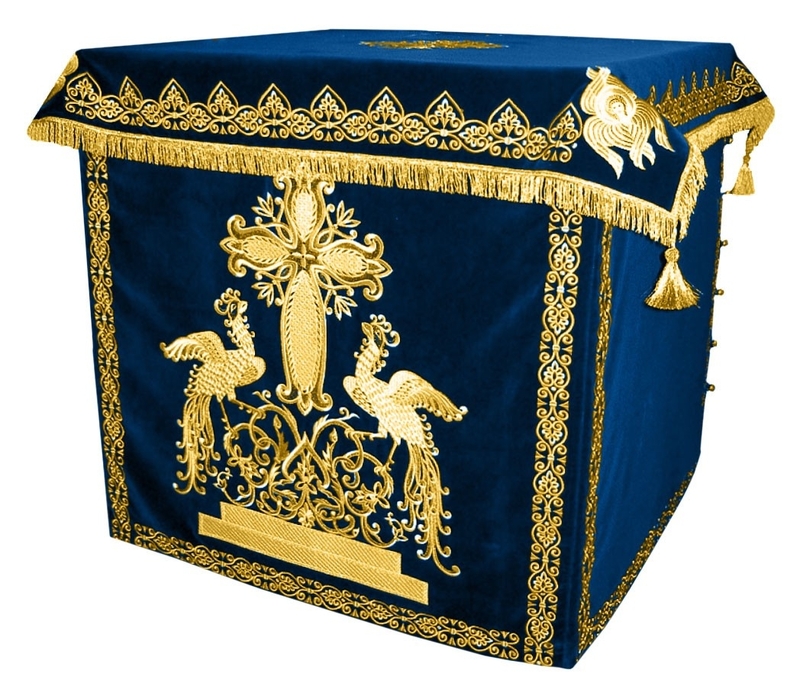 Are you looking for a richly patterned blue-gold Holy Table vestment? No one understands the requirements of Orthodox Christian churches better than Istok Church Supplies does, so you can stop your search right here. We offer high quality Holy Table vestments in a variety of liturgical color combinations including blue-gold. We understand the Holy Table is the most important focal point in an Orthodox Christian church during liturgical services. Referred to as the Tomb of Christ and the Throne of God, it is a piece of church furniture that makes the devout experience the Glory of God. Such an important item deserves luxurious treatment and that is exactly what we deliver. Our blue-gold Holy Table vestments are created from lavish church fabrics such as rayon brocade, metallic brocade and natural German velvet and are ideal for honoring the Most Holy Theotokos. We collaborate with the best church fabric suppliers from around the world to put forward a stunning collection of blue-gold Holy Table vestments. Customers will have tough time selecting from richly patterned brocades, each one more beautiful than the other. Holy Table vestments made from natural velvet material are a class apart because of the beautiful embroidery they feature. Many of them feature lavish frontal embroidery depicting revered Orthodox Christian icons and other attractive designs. The Holy Table vestments we offer completely cover the Holy Table and reach to the ground. To have a perfectly sized vestment, we recommend placing a custom order by making a specific mention in the Notes section during order placement. For some products, customers have the option to choose between standard and premium decorations. They can also add natural velvet inserts for an extra cost. Prices of these vestments range from around four hundred dollars to under three thousand dollars for the premium designs. Feel free to check our bestsellers and explore our entire collection of blue-gold Holy Table vestments!